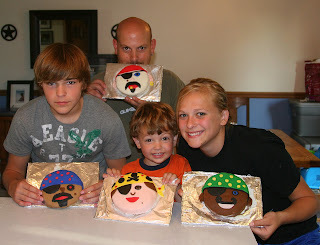 So today (since the boat trailer is still being worked on and no lake for us) we all made mini pirates.. and here are the results..
those are FANTASTIC!!! where'd you get the colored fondant? and the MAD SKILLS?!?! 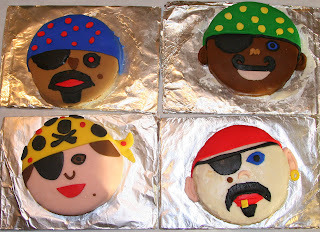 it was pretty fun to make... but UGH tasted like pooo... One layer of fondant is ok.. but when you double/triple the layers.. it gets kinda icky..
gammy says: "from one pirate to another -- those are AWESOME!!!" VERY COOL!!! looks like yall are having a fun summer! Can't believe Ben will be 3! !